I recently discovered an incredible website that shows you the income levels of different neighborhoods. Called “Rich Blocks, Poor Blocks,” the website uses a heat map overlaid on a Google map and in this case visually represents the income disparity issues I mentioned in this post — i.e. 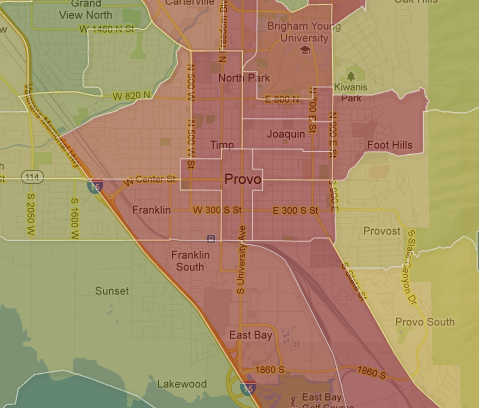 Provo is poorer than the cities to which it is most often compared. 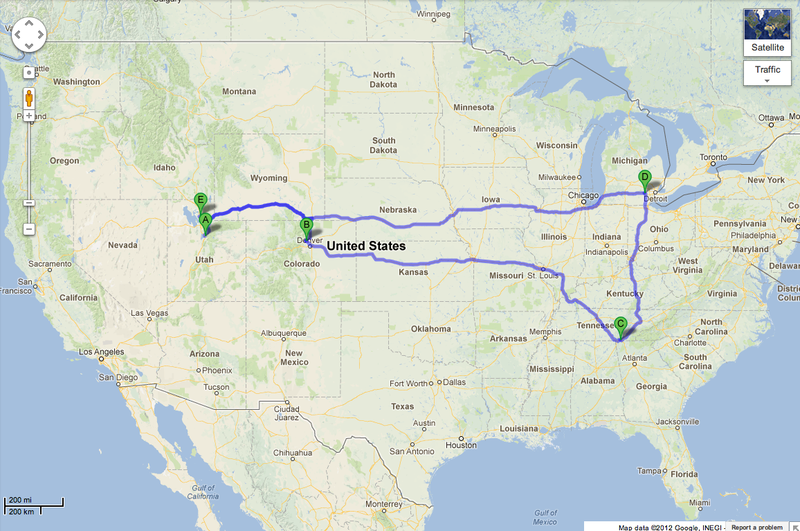 The city is red because it’s on the lowest end of the spectrum. 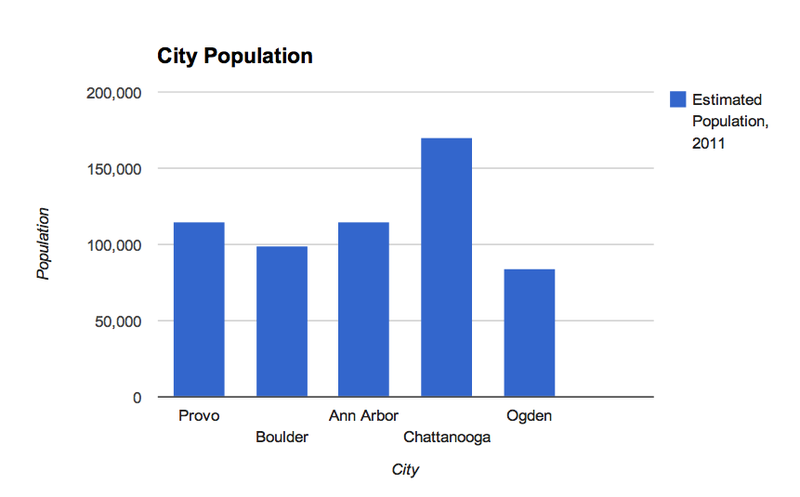 Hopefully this image helps disabuse people of the idea that Provo’s low income stats are the result of students or other unique factors. As the map shows, lower-than-average incomes are common throughout the city. 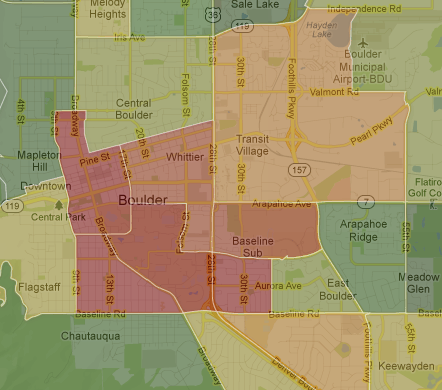 Boulder clearly has it’s own area with a high concentration of lower income earners, but its map also includes bigger swaths of more colors. Tellingly, the peripheries are darker, indicating higher incomes. 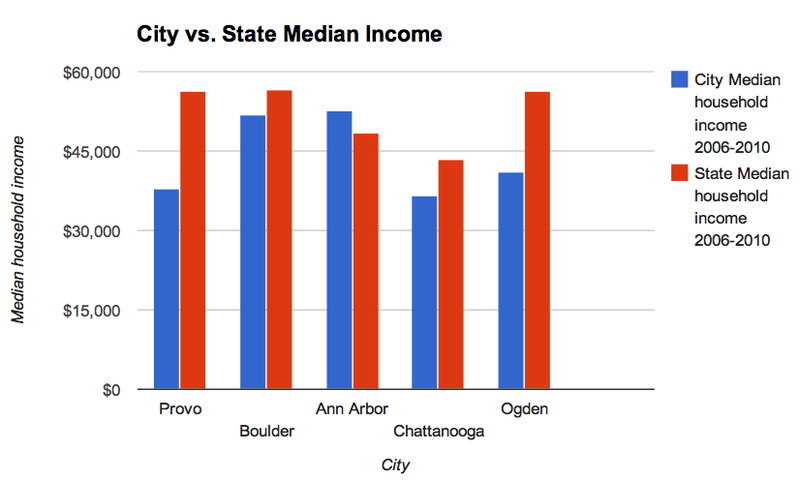 As I argued throughout the series on income and poverty, this is one the biggest differences between Provo and Boulder and is a major reason why the Colorado city may seem more vibrant. Obviously the physical makeup of these cities influences income distribution; Orem is more uniformly filled with single family homes so there are fewer places for low income people to live there. And long term Provo’s more diverse housing and demographics will surely be an asset. 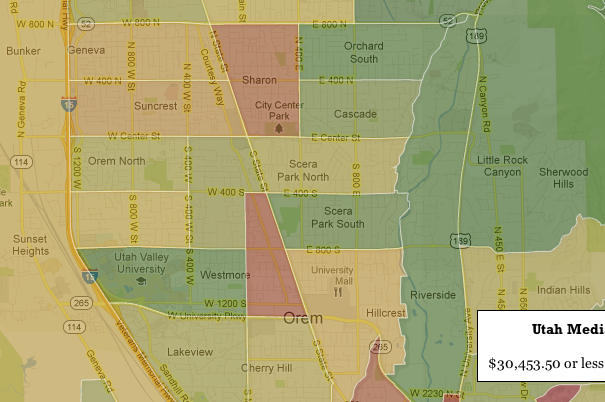 But based on this map Orem has a lot going for it; there’s simply more money there. No one map or statistic (or blog post) paints a full picture of how income shapes a city’s physical and economic environment. But as I’ve argued before, it will be difficult or nearly impossible for Provo to feel more like Boulder or Ann Arbor when it’s poorer.